Remember this photo? I included it in my French-Inspired Maple is the Staple Luxury Dinner Party write-up for my Project Food Blog Challenge #3 entry. It was way down at the bottom of the post but that’s not to say it wasn’t important. In fact, I themed my entire 5 course dinner around this one dessert! Maple is a big-time New England flavor, especially in the fall, and it’s one that I’ve come to love baking with in the past few years. And it just so happens that this pear-maple cobbler recipe was chosen in advance by Josie for Project Pastry Queen’s post last week. Pears and maple in the same dessert? I’m sold! It was a dessert I was truly looking forward to making from The Pastry Queen so I decided to theme my entire dinner party around the maple in the recipe. And boy was I happy with the end result of these cobblers. Not only are they pretty to look at but the overall flavor was spot on. The pears were baked to perfection. They softened but were still firm enough to let you know you were eating pears and not mush. The maple mingled with the nutmeg (which I reduced by half in the filling and topping) and produced this warm and cozy flavor that made me want to pour a hot cup of coffee and snuggle up on the couch under a blanket. And the cobbler topping…well, that was by far the best part of the whole dessert. I originally thought there would be way too much before I started topping the hot filling with it, but I kept piling it on, and it turns out that it was the perfect amount. 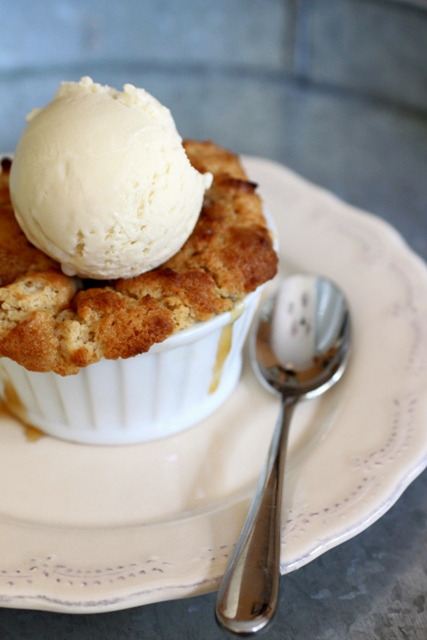 These individual cobblers were the perfect ending to my maple dinner party and topped with some cinnamon ice cream that gets all delicious with the warm topping, they’ll be the perfect ending to any of your dinners. To make the filling: Combine the pears, maple syrup, four, salt, vanilla, and nutmeg in a bowl. Stir well and divide the mixture evenly among six ramekins. Top each with one pat of butter. Place the ramekins on a baking sheet to catch any overflow and bake until heated through and bubbly, about 18-20 minutes. To make the topping: Meanwhile, combine the flour, baking powder, and a pinch nutmeg in the bowl of a food processor fitted with the steel blade. Combine the remaining nutmeg, cinnamon, and sugar in a small bowl and set aside. Melt two tablespoons of the butter and set aside. Cut the remaining 6 tablespoons into six pieces and add them to the flour mixture. Process until fine crumbs form. Add the cream, maple syrup, and vanilla, and process until just combined. Drop by spoonfuls over the warm pear filling. Brush the topping with the melted butter, and sprinkle with the reserved sugar mixture. Oh those look soooo delicious. I’m definitely going to be making these! Hmmm…I love the idea of individual cobblers. There is just something so decadent about having a whole dessert all to yourself. Also, the photo is lovely. I love the plate with the scalloped edge! OH yes…and I voted for you! I love the combination of pear and maple – I had it for the first time last December – absolutely delicious. This looks so good. I am absolutely heading over and trying out this recipe!! I love individual desserts and this looks fabulous!! I realized my link was wrong on the first one! sorry for the double post! Oh I’m so happy you posted this recipe. I had been drooling over this dessert since when I read your entry for challenge #3. I think this dessert totally deserves a dinner that revolves around it! Pear and maple is a combination of flavors I had not thought about before but I love it! i LOVE this idea! i think i might do a spin off of this recipe. sounds fantastic!